Candidates who wish to teach children in classrooms that are largely self-contained (Grades 1-6) should major in elementary education. This area of specialization combines the required general and professional coursework with exposure to a variety of educational settings, different professionals in the field, and a wide range of children at the elementary school level. Candidates engage in field experiences that include observations, site-visits, tutoring opportunities two practica, and a full-time student teaching experience. These field experiences are structured so that candidates have opportunities to apply what they learn in class to real teaching situations. (For more information on this see Field Experience tab). Using The Catholic University of America's conceptual framework, this concentration emphasizes the development of a reflective stance towards teaching in elementary settings. The ability to reflect independently on teaching practice and educational contexts is essential at this level. Elementary school teachers typically spend the workday in one room with the same group of students. They are constantly engaged in student interactions, problem solving, and decision making with limited support available from other professionals or resources. These circumstances could result in isolated, routine, and haphazard behavior. 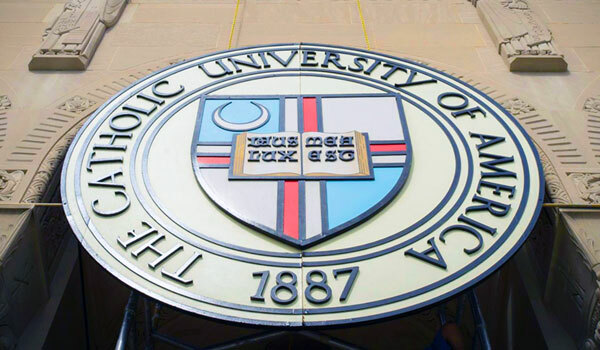 Catholic University's goal is to prepare dynamic, creative, and stimulating individuals who can overcome the institutional and occupational constraints that elementary school teachers face and who are willing and able to collaborate with other professionals in order to satisfy the educational needs of every student under their care. With a foundation in Catholic social teaching, the education program at The Catholic University of America focuses on developing teachers who are dedicated to improving humanity through education. As a first-year student, you will study philosophy, theology, and English as part of a small learning community of about 18 students. In these classes, you will reflect on the purpose of education and thereby equip yourself to be a more effective educator. Studying education at The Catholic University of America allows you to make D.C. your classroom. With museums, the Library of Congress, and research facilities a short Metrorail ride away, you will always have something to do and to learn. Additionally, with the variety of schools in the D.C. area, your student teaching experience is sure to be an asset to you wherever you teach in the future. The Department of Education at The Catholic University of America will offer you a strong community in which to learn. With a small number of students, you will become close to your classmates and learn from each other as you move through the program. Dedicated professors will serve as an important resource for you as they teach you the skills you need to succeed as a teacher. After graduation, you will be prepared to teach in the area of your choice or go on to further study. Graduates become pre-school, elementary, or high school teachers in a variety of settings, including public, private, or parochial schools, or even take their talents overseas. They also go on to graduate school to obtain a masters or doctoral degree in their area of specialty. The strong practical education coupled with the liberal arts education you will receive at The Catholic University of America will give you the skills you need to be the best teacher for your students.